Just before New Years I reached the very southeastern tip of India, Danushkodi. This ghost town located on a narrow strip of beach was once the start of the sea journey to Sri Lanka. However today the ferries no longer run, a victim of disasters both manmade and natural. I was nearing the end of my 60 day India E-Tourist visa and needed to leave the country before I could continue my planned journey up India’s east coast. I had planned to spend a week in Sri Lanka but despite the island being a mere 30 km by sea from Danushkodi one can only reach by air. So it was back to Trichy, several hours north to catch my flight on Sri Lankan Airlines to the countries capital of Colombo. After several days in Sri Lanka I fell in love with the country, overall travel and life seemed much easier than India and I quickly scrapped my plans to finish my Indian trip so I could spend more time in Sri Lanka. Like India Sri Lanka has an extensive rail network built by the British, but unlike India the railways did not seem so adamant about destroying their colonial heritage. 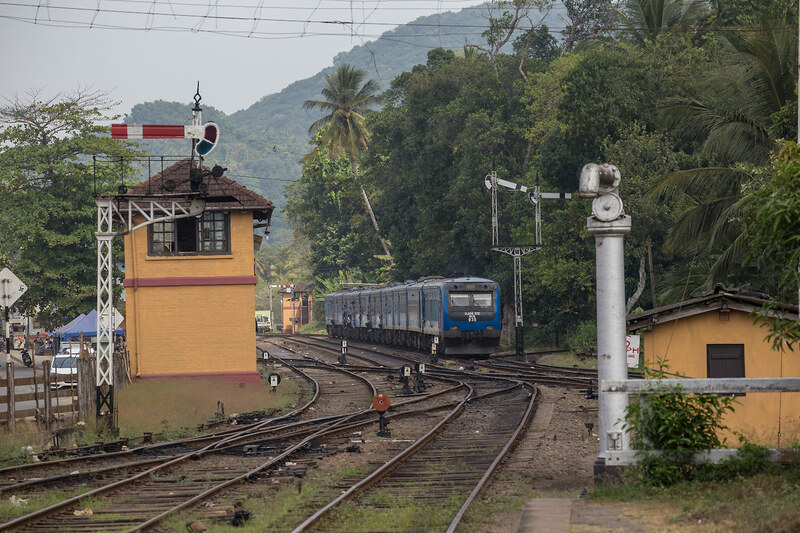 Things such as semaphores, token exhanges, and manned signal boxes which are rapidly disappearing in India are still alive and well in Sri Lanka with seemingly no plans to replace them. The railways also maintains a very interesting diesel locomotive roster including several EMD powered models, ALCO powered units by both MLW and DLW as well as Henschel and Hitachi diesel hydraulics. 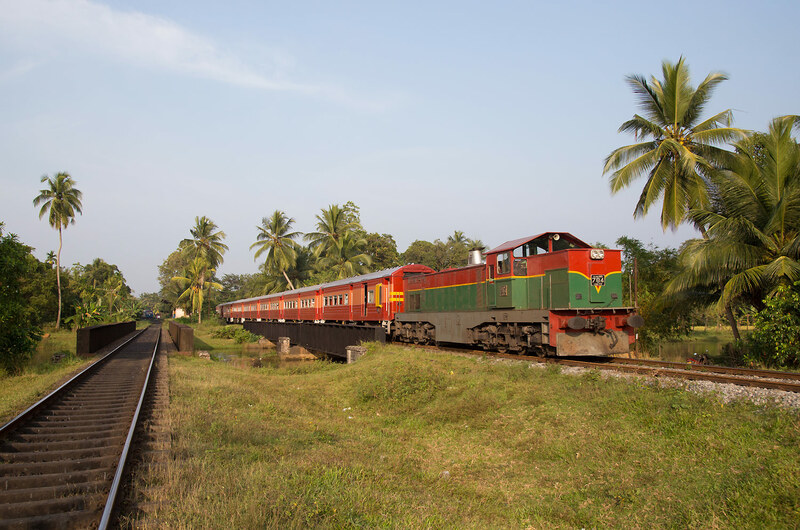 My first journey on the Sri Lankan rail network was on the “Main Line” between Colombo and Kandy, this fascinating line begins at sea level at the impressive Colombo Fort Station then continues through the suburbs and small towns surrounding the city. For a full journey on the mainline please click the video below, accompanying photos are further down the page. 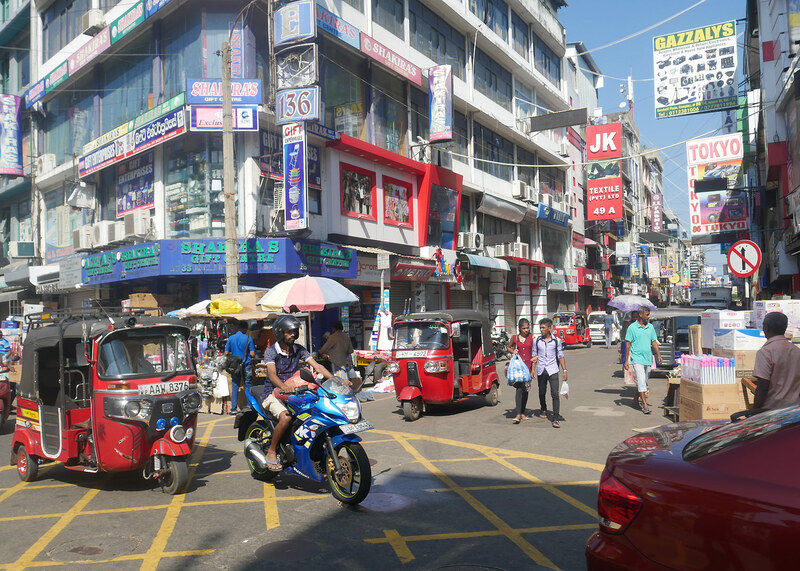 Our journey begins in the Sri Lankan capital of Colombo, a city of 5.6 million people located on the countries west coast. The city is a interesting blend of cultures, in contrast to many Indian cities the streets are generally clean and free of litter, the streets have sidewalks and crosswalks with lights that the cars actually stop for, a huge surprise for me coming from India where walking in cities was often taking your life into your hands. The familiar sight of rickshaws and Ashok Leyland buses were there though, all decorated in bright colors, the buses often featuring bright interior lights and blaring music. 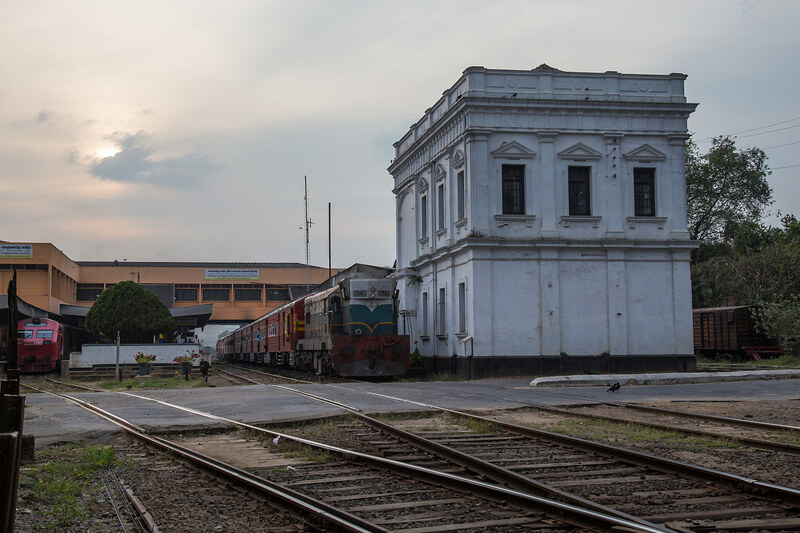 In the heart of the city lies the historic Colombo Fort station, named after the area which was in early times home to a Portuguese and then British fort. The station is a a true Victorian era gem in 1917 which features a covered trainshed. 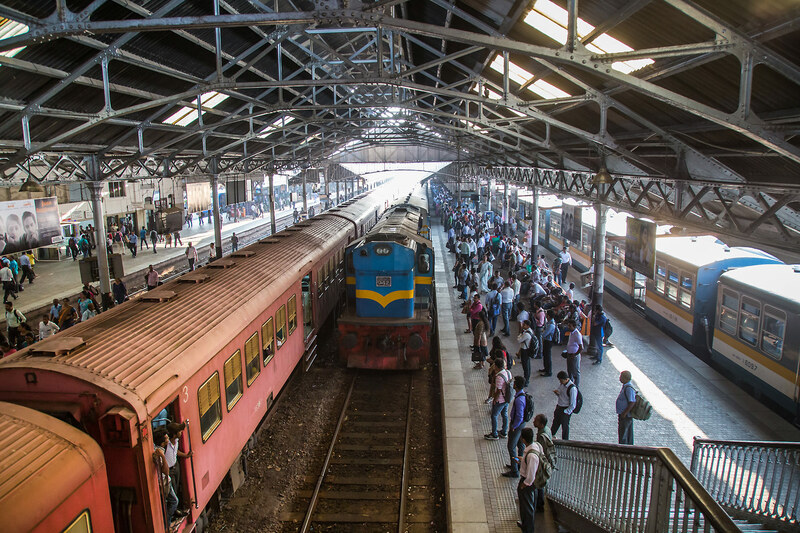 The station is the heart of the Sri Lankan rail system with trains departing to the furthest extent of the Sri Lankan rail system. The station is a hub of activity with everything from commuter DMU’s to long distance sleeper trains powered by locomotives from ALCO, MLW, EMD and Hitachi depart from under the trainshed. Like all stations in Sri Lanka one must buy a ticket to enter the platforms but even if you are not travelling a cheap 10 rupee (.06 cent!) platform ticket gives you the freedom to wander around to your hearts content. Our journey today will take us on the oldest rail line in Sri Lanka, built in 1867 to link Colombo to the upcountry capital of Kandy, today this first railway is simply known as Mainline. We will travel to Kandy aboard one of the most prestigious trains on the Sri Lankan railways, the Colombo to Kandy Intercity. 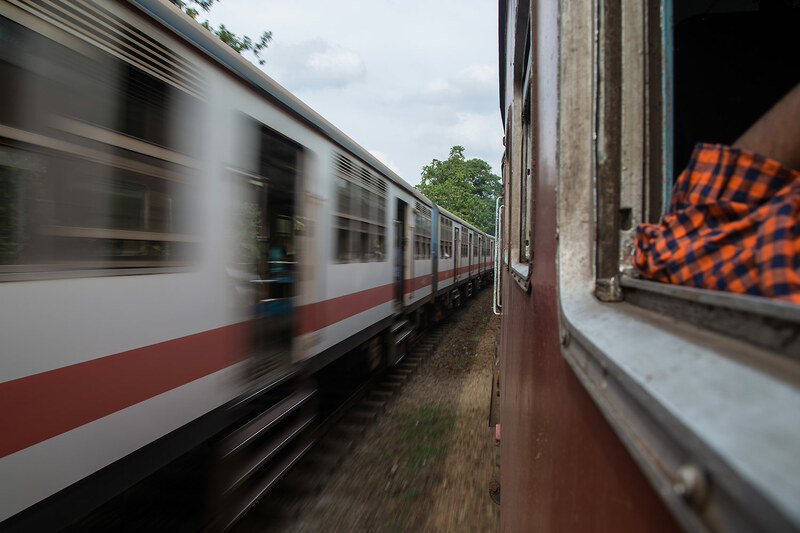 This train is the fastest train on the route and skips all the small stations in the Colombo suburbs making a direct run up to Gampha. Our train is powered by a M6 class diesel, these Hencheschel built EMD’s are the primary power for the upcountry railways due to their ability to negotiate tight curves. The Kandy intercity sporting a freshly painted M6 class diesels and the trains signature red and orange coaches. 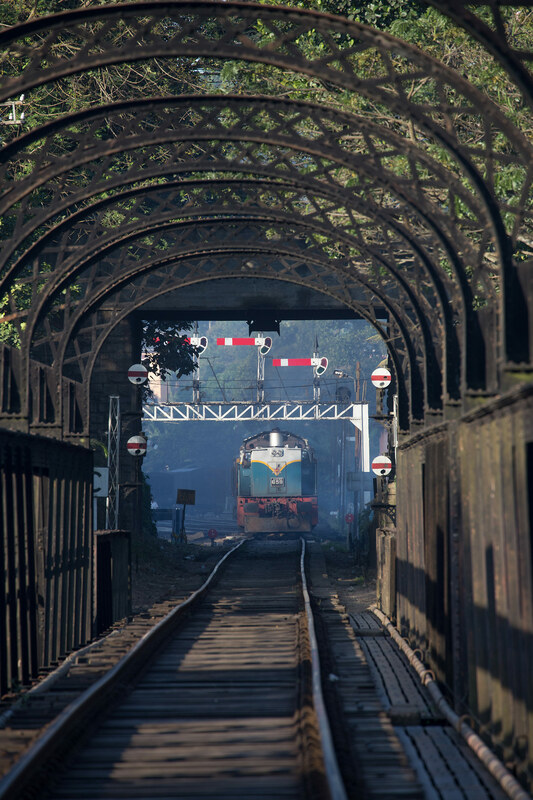 Our trains blasts through a succession of small commuter station and we pass through the vast workshop complex at Maradana, all manner of interesting stock can be seen on the siding including several rusting steam locomotives. 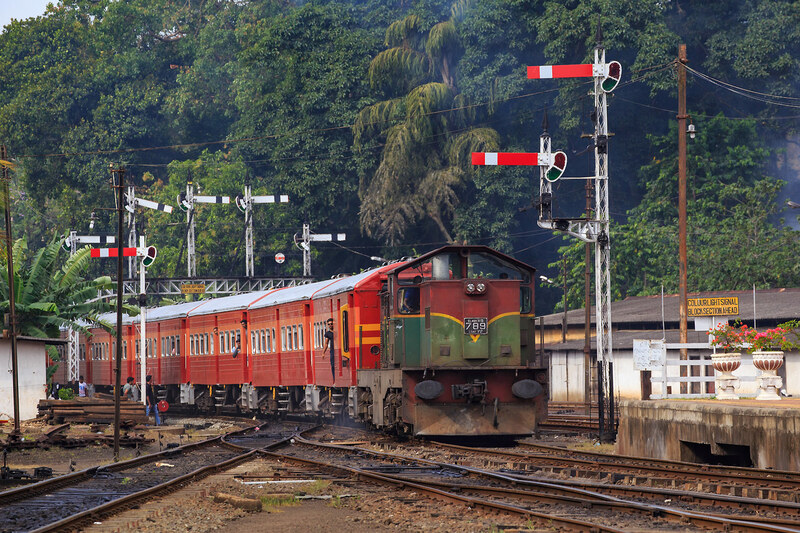 The first segment of the line is heavily used by Colombo commuter trains and we pass a wide variety of DMU’s. 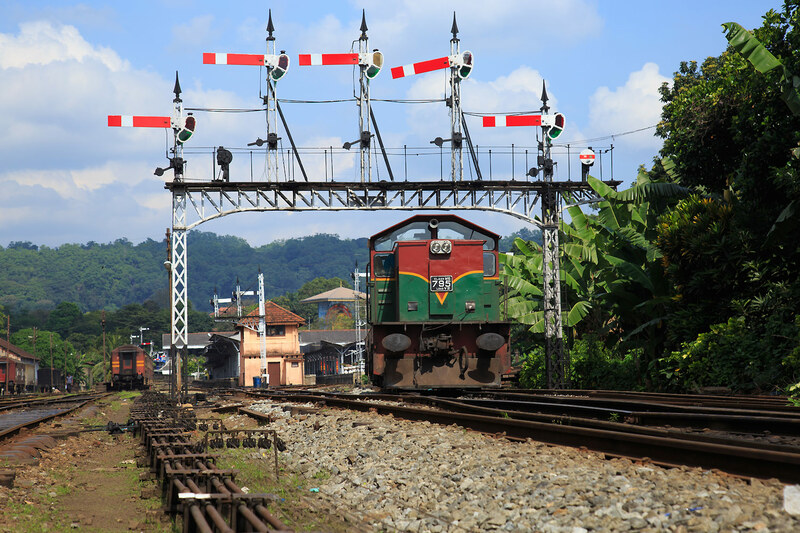 The Sri Lankan railways has always sourced their equipment from a wide variety of sources and we see units built in China, India and even Japan. At Polgahwela the railways Northern Lines branch off from the mainline, ALCO locomotives can no longer work the mainline past this point due to weight and curve restrictions on the upcountry lines. The station can be a very busy place between the commuter, long distance and occasional freight. The Vavuniya intercity departs Polgahawela behind a vintage M2 class diesel. Next up is Rambukanna where all Colombo DMU commuter trains terminate, the line changes dramatically here as double track gives way to single, color light signals to semaphores and the flatlands to mountains. After leaving Rambukanna we climb steeply into the Allagala mountain range, the line passes through thick forests and high above the following road from Colombo. We pass several small stations which nowdays are primarily just used as crossing points. Later in the trip I visited one such small station, Kadigammuwa to see the lines British era control system in process. The entire upcountry railway still uses the Tablet system, a variant of the token system to control movements. Click below to skip to a detailed explanation of the system in the same video. A more detailed photo essay will be posted later. 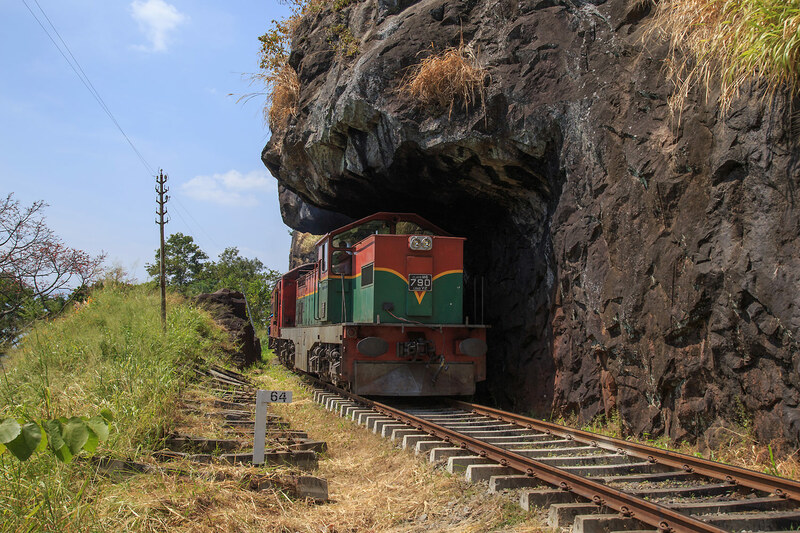 As we continue the climb to Kandy we pass through several tunnels, the most famous being Lions Mouth, named for the rock overhang just north of the tunnel that resembles a open lions mouth, seemingly about to take a bit out of the train! 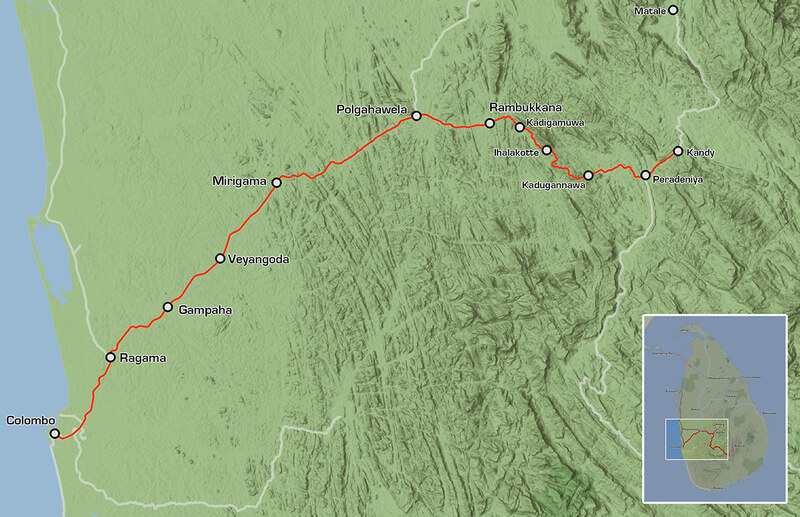 We crest the grade at Kaddeganawa, from here on it will be mostly level running to Kandy. 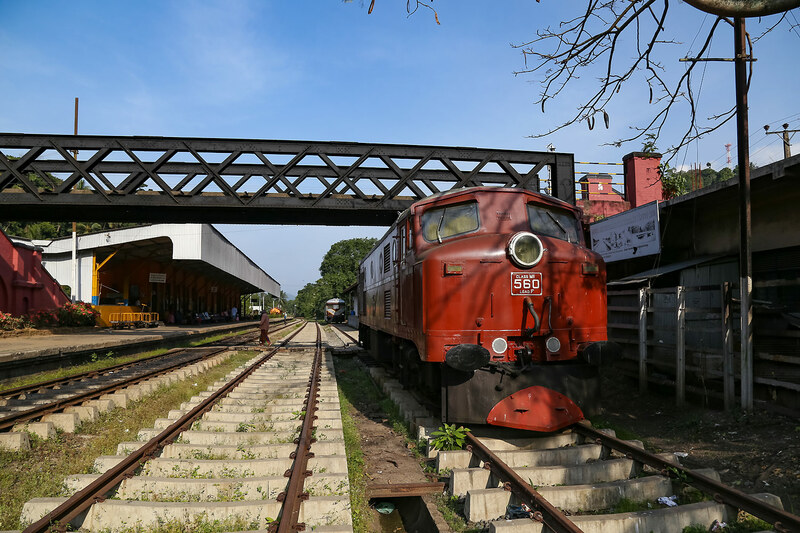 Across from the depot is the new Sri Lankan Railway museum which recently reopened after moving the collection from the old location in Maradana. 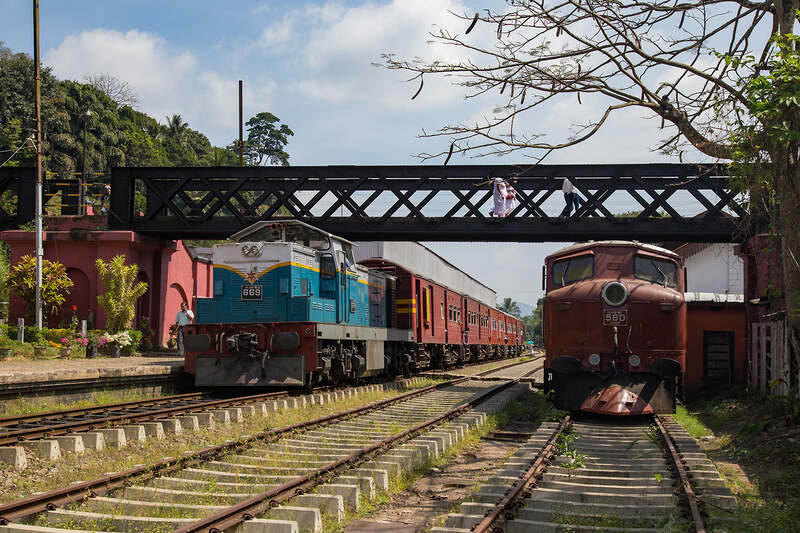 The museum has many locomotives and cars on display including the last surviving M1 class loco, the first mainline diesels to be imported into Sri Lanka. 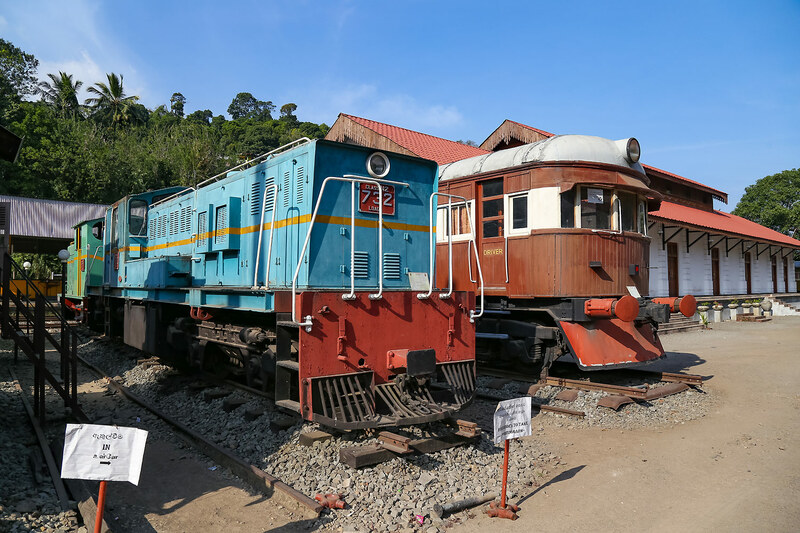 The next stop for our intercity is Peradeniya Junction, Peradeniya is the junction between the line to Kandy and the rest of the Mainline which extends to the upcountry town of Badulla. The station is located in the middle of a big wye and is a railfans dream with a plethora of semaphores and 3 manned signal towers. Just after departing Peradeniya we cross the old iron bridge over the Mahaweli River and then just 6 kilometers later we arrive in Kandy, the end point of this and many trains from Colombo. Kandy is the capital of Sri Lanka’s Central Province and is an important tourist destination. Many on the Sri Lankan tourist circuit spend several days in Kandy before continuing into the upcountry by rail. For the railfan the station is another absolute delight for railfans, the whole station is controlled by another fantastic array of British Era lower quadrant semaphores, all controlled by the a signal box with Armstrong levers. As soon as we arrive a Hunslet shunting locomotive quickly attaches to the end of the train and after all the passengers have detrained pulls the train to the coachyard. The locomotive proceeds to the turntable with the guards coach. The guards coach, locomotive and observation car must all be turned for the evening return trip. As I witnessed in Peru the turntable is operated by hand power and required perfectly balancing the locomotive over the pivot point. 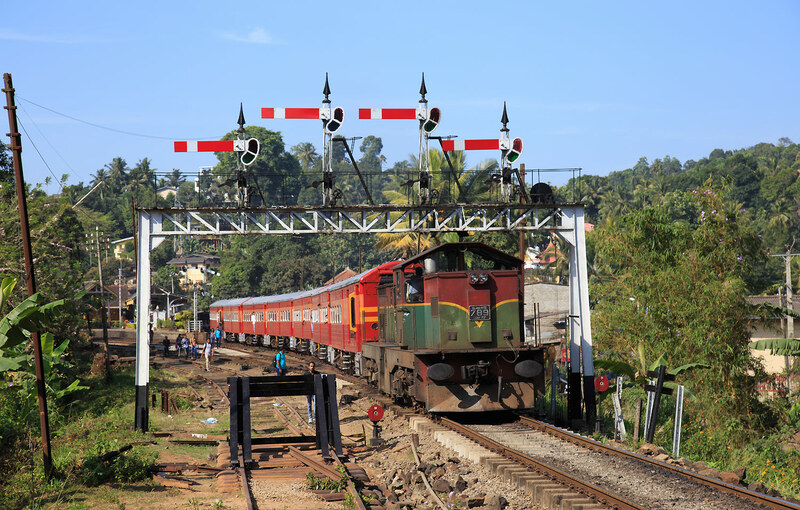 (Below) The Kandy intercity arrives amidst the array of semaphore signals that guard the station entry. (Below) The Hunslet hydraulic shunter attaches to our train. (Below) Turning the observation car and locomotive on the hand operated turntable. We are soon invited up to the signal box by the friendly signalers, the box is a true time capsule of early 1900’s British railroading and the whole station is controlled by Armstrong levers. The signal box has a total of 60 levers which are color coded according to standard British practices, the black levers control the switch points which are operated through steel linkages. The blue levers control the facing point switch locks which are an additional safety measure to prevent trains from running through switches. The red levers control the semaphore signals through steel cables. (Below) The entry signals to the Kandy station, the steel rods and wires can be seen to the left. 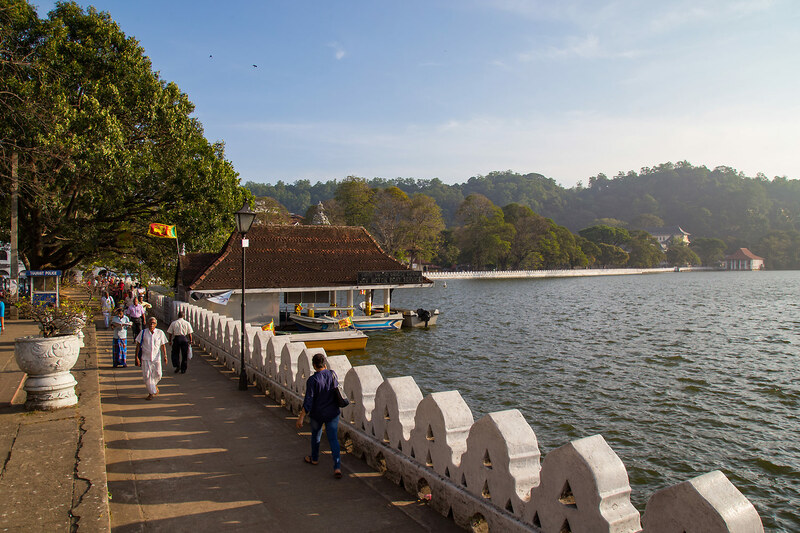 Kandy is a popular tourist destination and is the beginning of most travelers journey into Sri Lanka’s upcountry. 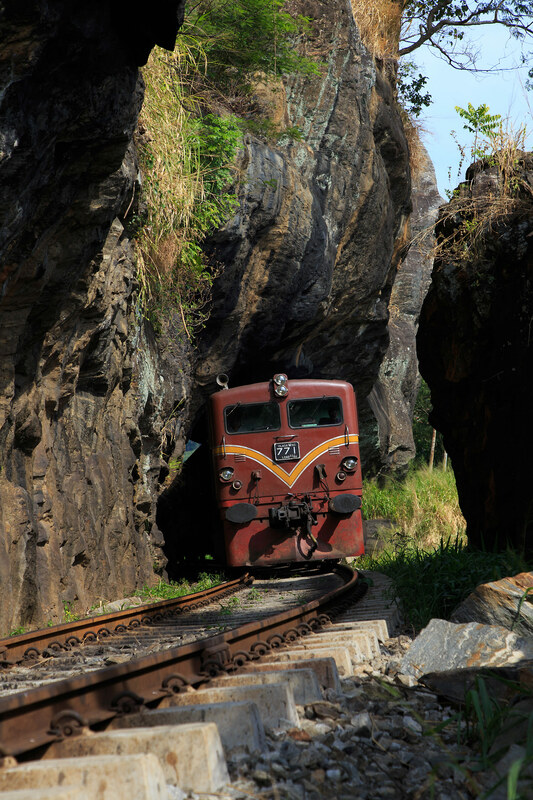 The line from Kandy to Badulla is considered by some to be one of the most scenic rail lines in the world and we will continue with that journey at a later time.